Can Your BDR Save Your Business? Your business seems to be humming along nicely and, BOOM, a disaster hits. Whether this disaster is caused by an act of God, a cybercriminal, or one of your own employees, you have to be ready. Today, we will look at several statistics that show you just how important having a well strategized data backup and disaster recovery plan is. We continuously stress the need for even our smallest clients to have a continuity plan. The bigger the business, the more comprehensive the plan has to be. After all, if there are a lot of moving parts in your business, you’ll have a lot of moving parts when it is hit with a data loss incident. In fact, we spend a lot of time talking about data loss and how it can negatively affect your business, but we will never be able to stress enough just how big of an asset your data actually is. All the expense that you’ve paid out in man-hours and resources can be lost in a blink of an eye, so doing everything you can to protect that asset is extremely important. The truth is, that for the small business, losing data can be the end game. Let’s take a look at some of the surprising statistics; and, for each we’ll break down what it potentially means for your business. So you run a deli, or a hair salon, or a small boutique. You have two computers that you use and one of them is your point of sale system. Why would you need to have a business continuity plan in place? The answer is in the name: Continuity. You don’t want to go out of business if something were to happen that would cause you to close your doors for a few days, would you? Your deli accepts credit card information through its dedicated point of sale system. The hardware on the system crashes...Now what? How good would it look if you told your regular customers that their financial information was lost? Even if it wasn’t stolen, you have to imagine that your reputation would take a hit. You run a small clothing boutique. One of your employees checks their email while they are doing inventory. They click on a link that infects your computer with malware. Can you let a simple mistake floor your business? A comprehensive data backup strategy will protect you from anything that can put your data at risk. From hardware failure to employee sabotage. 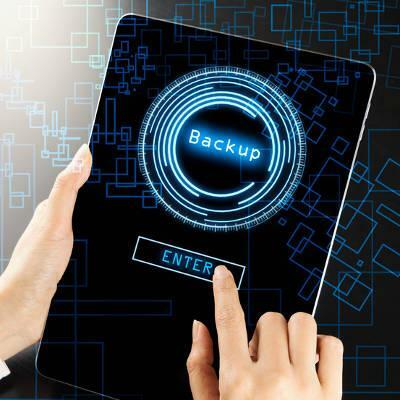 As an integral part of an overall business continuity plan, data backup protects your organization’s data in case something terrible happens. Statistic #2: Over half of companies have experienced a downtime event that was longer than a full workday sometime in the last five years. Downtime is a business killer. Think about it: during periods of operational downtime, your business is not producing anything, nobody is making any sales, AND you are paying people to sit around and twiddle their thumbs. It will be no surprise to learn, then, that the reason so many businesses fail after a data loss incident, isn’t that they didn’t back up their data, it’s that they didn’t recover enough of it fast enough. When we consult businesses, we stress the importance of redundancy. The BDR solution we offer has a network attached device that backs up data locally, but the device also pushes changes into the cloud, ensuring that data is stored in more than one place, and giving administrators peace of mind that if something terrible were to happen to their business, the data is safe. Statistic #3: Nearly 77% of malware-compromised organizations in 2017 were hit by “fileless” malware. Fileless malware? Now what?! Malware dissemination is getting much more sophisticated, and in the gaps of time where antivirus and firewalls haven't been able to react, people are having their data stolen and systems corrupted. Registry-resistant: Attackers store malicious scripts in the registry to help them survive system reboots and make it hard to remove. In-memory: Attackers utilize exploits and code-injection to load and execute malware straight from a system’s RAM. Living off the Land: By injecting malicious code into legitimate admin tools, an attacker can disseminate malware throughout a system without any warning at all. As it pertains to data backup, malware attacks can get pretty grizzly. Especially if they somehow make it onto the computing network and infect several endpoints simultaneously. By using a powerful backup and recovery solution, you can eliminate the normal downtime that an organization incurs when their systems have to have maintenance performed on them. This is because the network-attached BDR device can act as a server until hardware is replaced or repaired. To talk to one of our professional IT consultants directly about how much value a dynamic backup and disaster recovery solution can have for your business, call White Mountain IT Services today at 603-889-0800. Onsite Computer Support Services are available to businesses within 100 miles of Nashua New Hampshire. We have excellent onsite coverage from Concord NH, south through Manchester NH and then down into Boston. From Northern and Central Mass we cover from Worcester, east to the North Shore, including the Salem and Portsmouth NH area. Protected by Copyscape Plagiarism Checker - Do not copy content from this site.